And it's Affordable as Ever, no longer a subscription service. Having powerful features shouldn't mean too complex to use. That's why we've been enhancing the software so you can build and play your games more intuitively and quickly. iTabletop 3 is moving toward being more "point-and-click", adding right-click menus, keyboard hotkeys, and a WYSIWYG design where more of what you need to do is right there on the play surface, instead of having to go to separate windows. When other software competitors state their software is "lightweight and simple", what they're really saying is "lacking in depth." 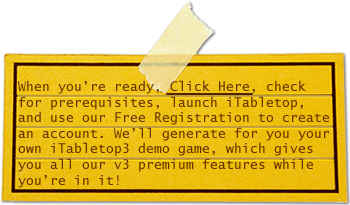 iTabletop 3 packs in tons of new features. We've added TokenNesting™, TokenActions™ Scripting, QuickNotes™, and QuickTokens™, and are currently building RealDice™ and RealCards™ - significant game-changers. 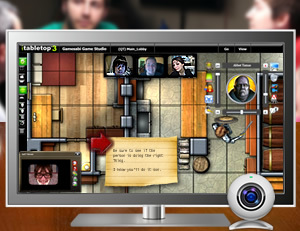 Even though we're building new features such as scripting, physics dice and dice cups, cards, etc., we're holding to our philosophy that iTabletop should be able to play any game, replicating the fun, "around the table" atmosphere. We make sure our new features don't lock you into any specific game or ruleset. As our TokenActions Scripting evolves, you may be able to incorporate game rules, but you will never be forced to. iTabletop has been around for years, and members have been using our unique, built-in community sharing system, uploading tons of great content for your games. If you need a certain kind of map, you can usually find something that works. If you need some cool tokens for your PCs or NPCs, you can find either the complete token itself, or the graphics you can use to make your token. Media files (including images, music, sound effects, videos, and PDFs), Tokens, and even entire Games, can be set to be shared with Everyone, or any website Groups to which you belong. Whomever has granted access to these shared items can duplicate and use them for their own games. This sets iTabletop apart, being faster and easier for you to get going with what you really came here for: running your game. After much input from our customers, we've recently made to move to a version-based pricing model similar to any off-the-shelf software. Let's face it, none of us want to sign up for a subscription. We don't want our bank accounts to be hit by a charge at the wrong time and have to deal with the possible fallout. Technologically we're still in the cloud. We still host our software and all your media using Amazon.com EC2, S3, and CloudFront. So you still get the benefit of the Software As a Service (SAAS) model, with its fault tolerance and high-availability, yet you're charged as if you purchased boxed software with a version number. All the benefits of the cloud, but no subscription fee. It took a revision in our programming habits, and it's a bit more complex on our side now, but we're happy with it and we're sure you will be too.